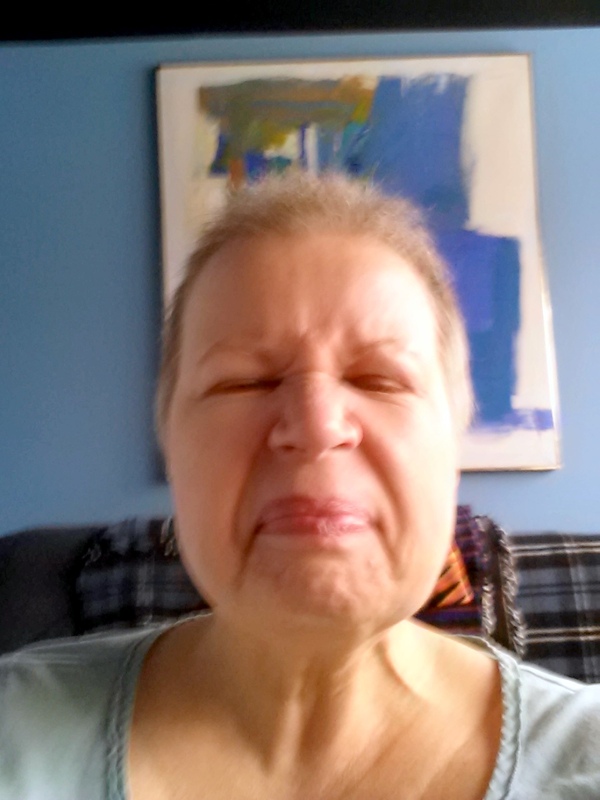 At 8:45 a.m. on Wednesday, I was off for blood work to prove my ability to withstand my first dose of my last cycle of this chemo drug, daunorubicin. About five minutes away from the hospital, I received a call from the nurse telling me that I needed to have a MUGA scan before I could resume chemo. It seems the MUGA scan determines if the chemo has caused my heart to skip a beat. Take my word, it hasn’t. I couldn’t remember ever having this test before, but they told me I had one in April. Go figure. How out of it was I back then? How out-of-it am I right now? Why isn’t this test called getting a MUG shot? Pay attention to the road, Emily. You have chemo brain. The problem was, they couldn’t do the scan until 1 p.m., so they wanted to know if I wanted to stay home or come in for the blood work and wait out the interim. Since I was only five minutes away and was equipped with my netbook I figured I’d just come in for the blood work, hunker down in a corner with my computer, have lunch and pick it up from there. Hey, I’m flexible. My plan proceeded as plan. I caught up on email, went to the café for lunch and checked in with the nuclear medicine receptionist, who I had earlier begged to let me know if an appointment opened up. She didn’t. The test would take about 1.5 hours. Fun. The tech led me to a little room. He looked like the poster boy for Dweeb Awareness Month. Lanky. Glasses too big for his face. Out of control curly dark hair. Anyway, he explained what would go down because I couldn’t remember ever having this test last April. That still bothers me. Are they billing for bogus tests? I remember them checking for this anomaly, but not with this test. Weird. Well, took two vials of blood and proceeded to add radioactive isotopes into the vials which would then be injected back into me after a thorough swishing. Of course, all the hazmat precautions where in order. While we waited 15 minutes for the blood to reach its destination, he asked what kind of music I liked because he would play anything I wanted during the scans. I told him I liked any kind of music for a half hour, except maybe rap for 15 minutes. Then we proceeded to the machine that looked pretty much like an MRI, but had flat panels emerge over my chest. There were to be three views that took about five minutes each with adjustment time between them. The tech had obviously used my age and gender to select the music. I listened to Carole King, John Denver, James Taylor and other soft rockers from the 60s and 70s. Not terrible, but I would have been cool with just going to the happy place in my head. The tunes were a distraction, but at least they didn’t make me want to get up and dance, which would have been a sure deal with someone like Santana. When he finished, he said they’d have the results by morning. I said that wouldn’t work because I needed the results for one of three chemo treatments over the next three days and waiting would go into Saturday when the Center is closed. He said he’d ask for a “wet read” which means “right away.” I learned the phrase is a throw-back to days when the scan really was on film and hadn’t yet dried. Cool. When I was cut loose, I went back to the Infusion Center for the treatment. It is now almost 3 p.m. and the space is much quieter. What’s really interesting is that the nurses are more real. All that morning fresh cheer has worn off and one is bitching about her teenagers. I would never here this in the a.m. Then she apologized for being so negative. I replied that her attitude’s authenticity was refreshing. (She’s one of the most fake cheery nurses.) When the scan results cleared, she loaded me up with an IV of anti nausea meds and then injected the vial of daunorubicin after putting on her protective gear. I am feeling like a walking toxic waste dump. This drug makes you pee red, but I’ve only seen peachy colors. Maybe I’m sufficiently hydrated. Cool. So… now I wait for more hair to fall out, more exhaustion and my immune system to crash, which usually happens in about 10 days. I’ve been through this before, so I’ll get through it again. No biggie. We are invited to two Halloween parties. One is a huge family event at my daughter’s house and the other is at a friend’s. I asked my son-in-law who I could be that my current hairstyle might accommodate.I look like a middle-aged guy with a receding hairline. He suggested a Buddhist monk. I like it. Not only is that my real spiritual leanings, it’s easy: three yards of cheapo orange polyester and prayer beads. I will post pics when I get it together. Almost Finished the Sunflower Painting—Yay! During my hiatus from posts, I finished my painting and am figuring out how to add the poem into the sky. It’s a poem that occurred to me in France while driving through the countryside and seeing the fields of sunflowers. where do they turn in the dark? Do they rely on the moon? Forget their addiction to sunlight? Face each other in confusion? Sleep, knowing a new day will dawn? There a lot of other events over the past two weeks that were wonderful and fun, but I feel the need to move on to more rather than report everything. I hope to keep a tighter, consistent rein on posting, but we’ll see. Thanks so much for continuing to read. i love to hear your comments too. The blog is set for me to review comments before they post, so if you comment and it doesn’t show up right away, it should soon. Thanks again and enjoy your weekend. May you have the energy and the will to press ever forward with this project and emerge successful like the smiling sunflower. 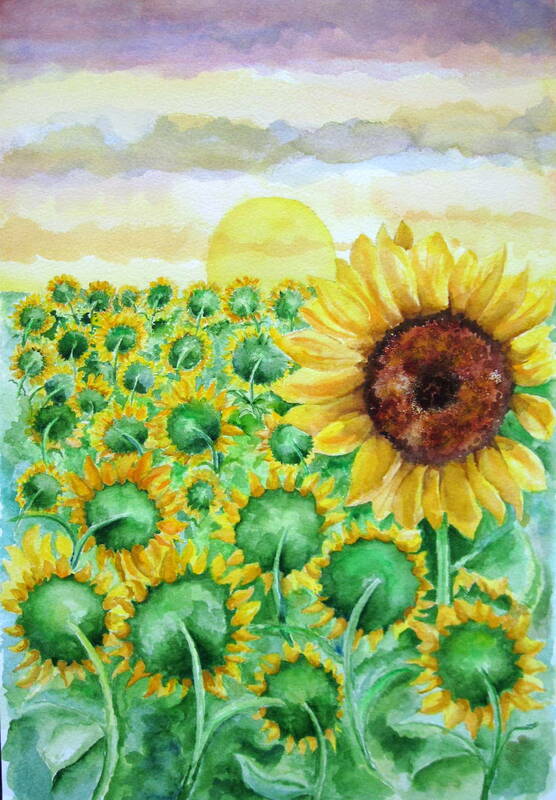 I really like the sunflower painting and the poem to accompany it. Love from one of your cheerleaders. Em — your painting and poem are beyond description…so thoughtful and you nailed the metaphor. Slam dunks coming from your heart and hands. That’s astonishing with all you’re dealing with, and managing w/so much poise. Of course your heart gets heavy, those brain cells start crashing into different ones and your world changes without you’re getting a chance to prepare and pack. BUT, you are a warrior and even in the worst moments you create all kinds of beauty. I wish I could simply say “don’t despair,” and you wouldn’t anymore. In lieu of that, I urge you to look at your work like a “consumer.” You will be blown away. You rock. Dear Em – I am liking the Buddhish monk idea too for Halloween. I love Halloween, but have no parties to go to! Darn – may dress up for work anyway! How do you get to your spiritual mental place to make it through these treatments? The poem is lovely, and the painting is really really awesome! So Cheerful and strong – just like you! Yes, Anne…knowing a new day dawns is certainly comforting. Ah, yes….the MUGA scans. I’ve had three, and am supposed to schedule another one, as the arsenic and daunorubicin did ding my heart a bit. I hated that scan- and for no good reason. I love the sunflower painting !